Once again, one of Steven's friends held her annual pie competition. This year I learned more about the genesis of the idea: there was a guy she used to date, and his family had a tradition of getting together after their regularly scheduled Thanksgiving Feast to have a fierce pie competition. It sounds like a rather odd idea to me: first, it doesn't seem practical to be able to really evaluate many pies after a feast - there just wouldn't be any ROOM to eat more, if their Thanksgivings are anything like mine. Second, you'd think that relative-filled holidays would be stressful enough without overt competition. I mean, covert competition between family members really ought to satisfy everyone, right? Anyway, she revised the tradition to be a stand-alone event at her house, detached from other food holidays. She invited us last year (I wrote about that here) and we got a feel for what the event was about. Steven and I discussed our strategy for this year, and we decided (1) that we didn't really share the tastes of the folks at the party, and so we should make a pie to please ourselves, and (2) that the trophy (a ceramic rooster teapot) wasn't something we should really concern ourselves with competing for. 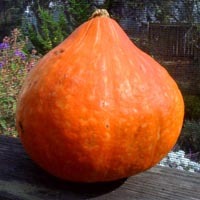 I may have mentioned that we got a really wide range of winter squash for carving on Halloween, and there were two or three that I had selected specifically for baking. 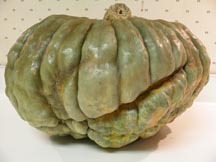 One of those, weighing in at over 20 pounds, was an unusually lumpy "French" squash which looked like a hubbard mixed with a Hokkaido, mixed with... a brain. I'm attaching a photo Steven took of the squash before we baked half of it. 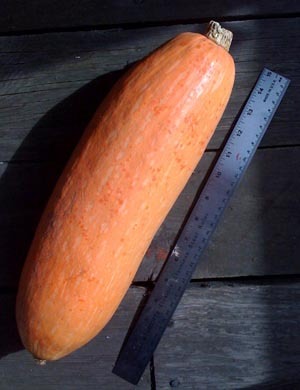 Anyway, the enormous squash had more than three inches of thick flesh all the way around, and baked to a nearly buttery, smooth texture. In other words, it was PERFECT for a honey-sweetened, cholesterol free "pumpkin" pie. Steven named it "lumpkin," which was cute. I made the crust, and he made the filling according to my usual recipe, but he cut out an adorable little jack-o-lantern face out of crust to put on the top. It baked beautifully. Off we went to the pie competition, planning to have fun and NOT win. All went as planned. -grown-up grasshopper pie: a mint cream frozen pie, made with mint Bailey's. It had a chocolate cookie crust. Though I'm not a frozen-cream pie kind of person, this was a really great example of its genre, and I voted for it as best overall. This meant it was not going to win. -strawberry pie, by the same person who made the fabulous strawberry rhubarb pie last year. This was very, very tasty. -pecan pie, in two separate varieties: a drier, more solid "Indigenous Treat" pecan pie, and a maple bourbon pecan. The maker of the latter pie also handed out shots of bourbon as part of their presentation. (The hostess joked that she'd hand out twenty dollar bills next year as part of her presentation.) I'm not a huge fan of pecan pies, though these were both respectable. This means that one of them was destined to sweep the awards in nearly all categories - the one that involved bourbon shots, of course. -"pink inside," which was basically pumpkin with a layer of cranberry cream. This had a ginger snap crust. This was an interesting idea, but the flavors competed too much for me. Steven enjoyed it. -apple pie, in two separate variations: one that was soupy inside (a ladle would have helped), and one that was made with bacon. No comment. -"oil spill," a comment on the recent oil spill that is contaminating the San Francisco Bay. This consisted of "apple pies" purchased from our nation's largest fast food chain, which were crumbled up, covered with crushed Frito chips in a dinosaur-shaped pan, surrounded by small dolls and a photo of Jesus, and slathered with chocolate sauce. This won for "most original." I told the hostess that I couldn't vote in any category for a pie I was fundamentally unwilling to eat: otherwise, the "most original" category could go to a frosted brick, or a pile of leaves. She told me that made me a harsh judge. You can see how, if I'm actually going to be voting for things based on their fundamental pie-ness, I've gone astray in this particular event. -cran raspberry. This pie was in a tall, cylindrical, very hard crust, and was covered with crust cut-outs of animals. I voted for in the "best presentation" category. It won, ruining my otherwise perfect record record of having nothing I like win. There is a catch, of course: after the judging was over, the baker admitted that she had added bacon fat to the crust, and merrily said, "it's not like you said it had to be vegetarian, right?" Great. Being a local girl, I can't imagine putting in an ingredient like that and not disclosing it: even before thinking of other vegetarians, I would think of people I know who are Jewish who would need to be able to avoid that dish. I only had a narrow strip of the pie, and didn't eat all of the crust on that small piece (because I couldn't break the last part with a fork, because it was hard), so I'm hoping I will not be in the bathroom being violently ill in three hours, the way I was the last time someone hid something like that in my food. So, the evening was fun and educational: everyone was in a good mood, and people were fun to chat with. Among other things, Steven learned that TWO samples of each of the pies (excluding the apple-bacon) was one sample round too many.